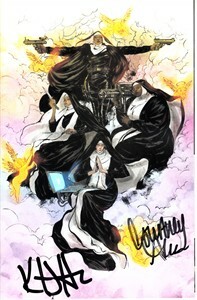 Sisters of Sorrow issue #1 2017 San Diego Comic-Con exclusive comic book autographed in black marker on the cover by co-writer (and Sons of Anarchy creator and star) Kurt Sutter and co-writer Courtney Alameda. Obtained in person at limited 2017 San Diego Comic-Con signing. With certificate of authenticity from AutographsForSale.com. ONLY 3 LEFT.